Kevin Crockett, Senior Executive at Ruffalo Noel Levitz, provides an overview of the challenges that higher education institutions across the nation are currently facing. 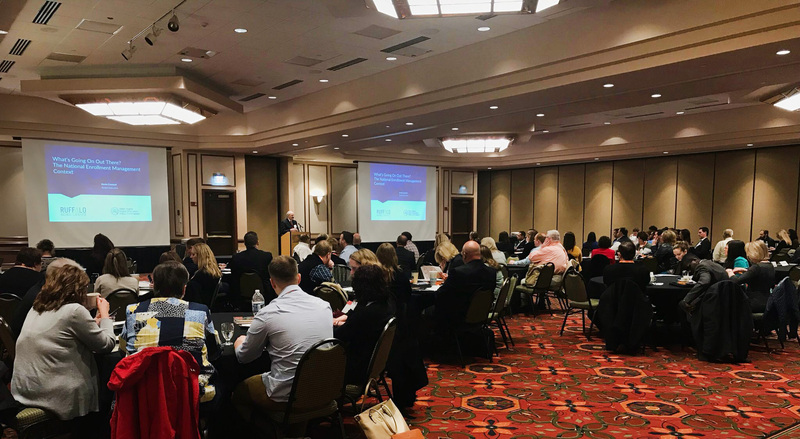 CHARLESTON, W.Va. – Admissions and enrollment staff from across West Virginia joined together on Tuesday to learn how to encourage more West Virginians to sign up for classes this fall. The West Virginia Higher Education Policy Commission (Commission) and the West Virginia Community and Technical College System (CTCS) hosted the one-day Enrollment Consulting Workshop for professionals engaged in campus enrollment management efforts at West Virginia’s two- and four-year institutions. Attendees learned about trends in national college enrollment, including best practices for marketing and recruitment and how to customize those methods for the best results at each institution. Speakers from the national college marketing and enrollment management firm, Ruffalo Noel Levitz, joined state officials to lead the classes. Michael J. Farrell, Esq., Chair of the West Virginia Higher Education Policy Commission, welcomes guests from West Virginia’s public two- and four-year colleges to the Enrollment Conference. Michael J. Farrell, Esq., Chairman of the Commission, said understanding state and national enrollment trends is important if West Virginia’s colleges and universities hope to alleviate concerns about a smaller market from which to attract future students. “Because enrollment numbers have leveled at our four-year institutions, now is the perfect time for enrollment managers at our schools to join forces to help more students go to college,” Farrell said. “West Virginia is one of the most affordable states for postsecondary education, and we have some of the country’s best financial aid and scholarship programs for our students. “West Virginia’s colleges and universities are a tremendous value and this is a wonderful state in which to go to college. We have a great higher education product, but we need to do a better job of helping our residents and potential students realize that a strong college education is not only possible here, but it’s affordable. Robert L. Brown, Chairman of the CTCS, noted the importance of professional development opportunities for representatives of higher education in strengthening the state’s workforce. To learn how the Commission and CTCS are working to help tackle the issue of enrollment in postsecondary education, visit www.wvhepc.edu and www.wvctcs.org.